The giraffe is Hannah’s animal. Every time I see a giraffe I think of her. I have the urge to purchase every giraffe stuffed animal I see and every baby item that has a giraffe. I’m able to control myself sometimes and other times I just give in. Most people know the giraffe is Hannah’s animal. 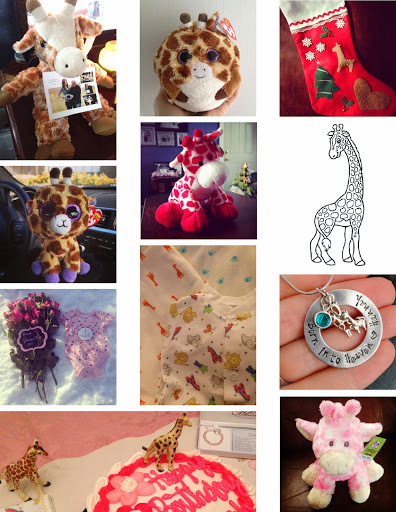 Recently, I have been asked the story behind the Giraffe as her animal and how that came to be. To be honest it was completely unintentional and it evolved on its own and it evolved fast. After we received the devastating news for the second time at CHOP, we knew that we wanted to have a 3D/4D ultrasound done. We wanted to have this done when we first found our we were expecting before the devastating news. But now we knew we had to schedule it right away because we didn’t know how much time Hannah had left with us on this earth. We were able to get an appointment for December 19th, 2013 at 1pm in the afternoon. We invited our parents and siblings to come. At this point we weren’t 100% sure that Hannah was a girl, but based on the anomalies she most likely was. Jason’s parents and sister were able to attend and so was my mom. It was wonderful seeing Hannah on the screen, but unfortunately (except for the back of her head, neck, and ears) we weren’t able to see her in 3D. She was positioned with her face in the placenta and facing my back with her legs under her body. That meant we weren’t able to see her gender either. After seeing her, seeing her heartbeat, and hearing her heartbeat and multiple attempts to get her to move the session ended. The owners of InnerView Ultrasound were so nice and knew the whole situation and why we were there in Hannah’s 23rd week. They offered for us to come back again on January 2nd, 2014 and we quickly agreed. They were aware that something could happen sooner than anyone wanted to admit. We knew that we wanted a stuffed animal with Hannah’s heartbeat inside and now with the fatal diagnosis we wanted to get our mothers each a stuffed animal with her heartbeat for Christmas. I had a strong feeling that we should all pick out the stuffed animals that day and not wait. This was an extremely emotional time, especially for our mothers and they picked out the stuffed animal that would hold their granddaughters heartbeat. They had many cute stuffed animals and all different sizes. Jason’s mom picked out an adorable white bunny. My mom picked out a sweet lamb, because that is what she did my nursery theme when I was a baby. Even as I type this I’m fighting back the tears and I’m barely winning. I really liked a pink bunny that I saw, but I didn’t want to get it for the slim chance that she wasn’t a girl. Then we saw the giraffe. It was adorable. We instantly wanted that one. We were surprised that we were so confident and chose a giraffe. The giraffe is not our favorite animal, but we needed and wanted that one for our precious baby. The giraffe still didn’t become Hannah’s official animal. We had no intention of it being the giraffe. We had no idea Hannah would have an official animal. That following Sunday on December 22nd, 2013 we were Christmas shopping and I wanted to make sure we bought a special blanket for Hannah to be wrapped in when she was born (here come the tears again). I wasn’t sure what I wanted, but I knew it had to be special and I would know it when I saw it. I personally didn’t want to go to a Target or a Walmart etc. (nothing wrong if you choose or chose to, this was just my personal preference. I love Target!). We are lucky enough to have had a small Carter’s store open us near us and I wanted to go there. It was so hard walking in that store knowing that Hannah could never wear any of these adorable and tiny outfits. After a few minutes I saw the perfect blanket. It was a swaddle blanket covered in giraffes. I had to get it. It was perfect. Then my eyes instantly went to the security blanket next to the giraffe print blanker. The security blanket was white with a white a giraffe and on the side it read, “Mommy loves me.” I had to have them both. I handed them to Jason to buy. I could barely hold back the tears. I couldn’t stay in the store any longer and had to walk outside and wait for Jason. I walked a few feet away from the store and just cried. In those moments Hannah’s animal officially became the giraffe. We couldn’t be happier and we love how special this has become to us and how it happened organically. We didn’t need to say a word to our close friend and family. 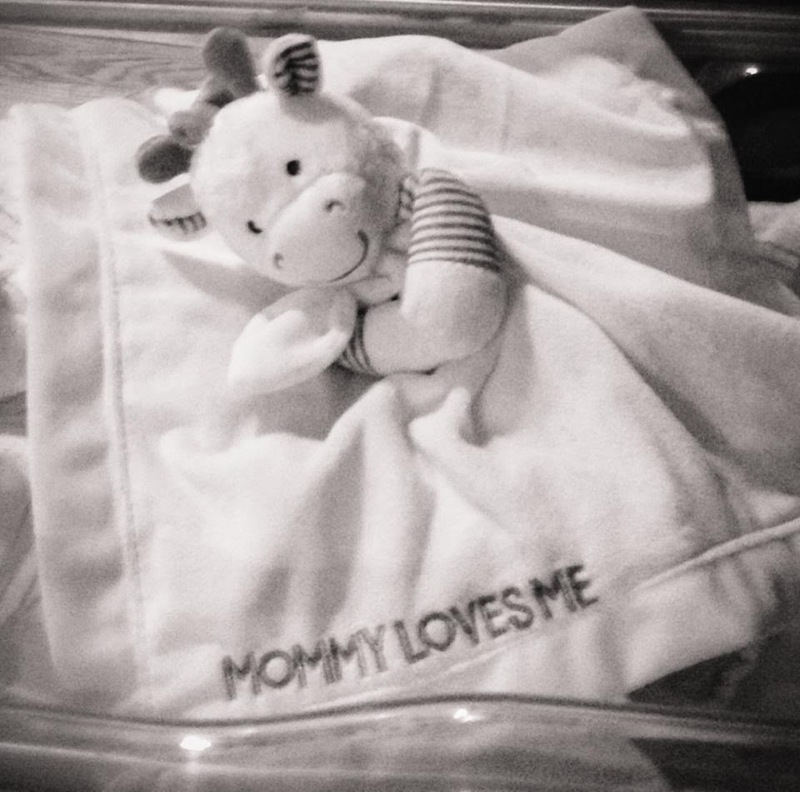 They just knew when Hannah was born the next day and saw the giraffe blanket she was wrapped in and the giraffe security blanket snuggled with her. My close friend came to visit me and gave me the cutest TY Beanie Ballz giraffe named Tippy! It’s missing one of its ears. It wasn’t torn off or anything. Tippy simply didn’t have that one. This made Tippy even more special because even though she’s not perfect according to the world’s standard she’s still perfect to me, just like Hannah is. My close friend also gave me a keepsake necklace in memory of Hannah complete with a mommy and baby giraffe for Christmas. To celebrate Hannah’s birthday we bought baby giraffes to put on and with her birthday cake. We will use them with her birthday cake every year. I made a Christmas stocking for Hannah with a giraffe and a giraffe patterned heart on it and we will hang it for her every Christmas. The outfit Hannah was buried in wasn’t fancy or girly. It was a micro preemie onesie that had giraffes (and other safari animals) on it. I bought the exact same giraffe blanket, that she was wrapped in the day she was born, so she could be wrapped and buried in the giraffe blanket that matched. We included a drawing of a baby giraffe in Hannah’s funeral programs too. I couldn’t part with the one she was wrapped in at the hospital. Now we each have one. To celebrate Hannah’s monthly birthdays for the first year and her yearly birthday every year after that, we use a chalkboard with a cute giraffe sticker on it. We talked to our close friend and family how funny it is how the giraffe just became Hannah’s official animal. We wouldn’t have it any other way. Hannah knew her favorite animal from the start. « A Surprise at the Door!